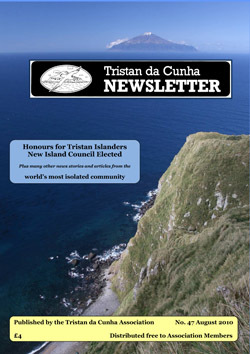 The 'Tristan da Cunha Newsletter' is a full colour magazine for members and islanders published twice per year. It has news and feature articles, lavishly illustrated with photographs that do not appear on the website. 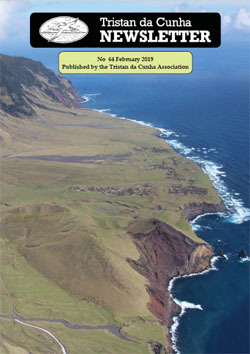 44 pages of Tristan news and features, published in January 2019. 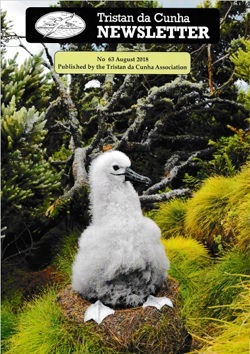 52 pages of Tristan news and features published in July 2018. Details of the Association's policies regarding privacy and data protection. 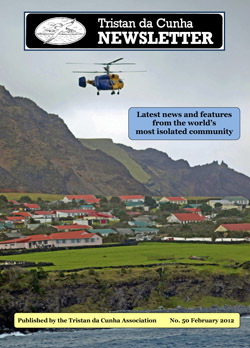 48 pages of Tristan news and features published in January 2018. 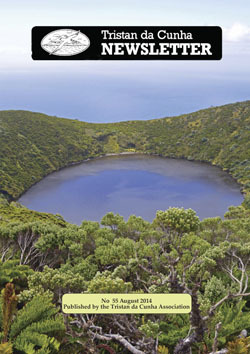 48 pages of Tristan news and features published in July 2017. 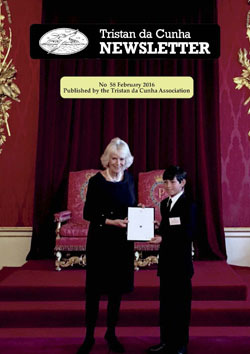 44 pages of Tristan news and features published in February 2017. 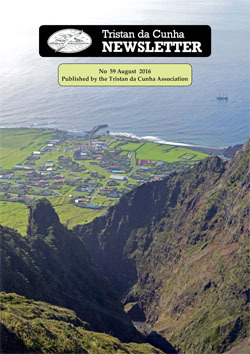 44 pages of Tristan news and features published in July 2016. 40 page full colour magazine full of Tristan news and features published in January 2016. 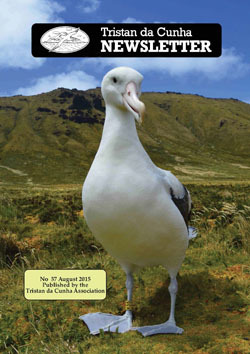 40 pages of Tristan news and features published in July 2015. 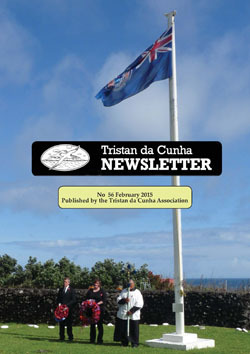 Tristan Association Matters including a photo report on the 2015 Annual Gathering. 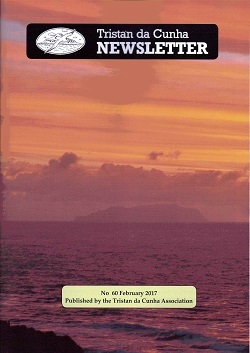 posted to members at the end of January 2015. 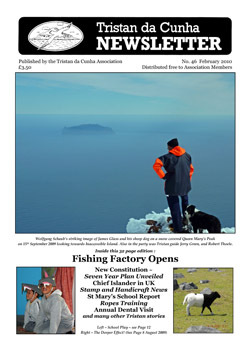 Eight Page Fishing Feature including EU Lobster exports, MSc for James Glass, Development of the Tristan Fishery from James Glass, recent Marine and Fisheries Research by Rob Mrowicki and Charles Kilgour and recent marine discoveries. 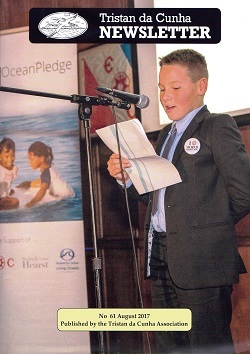 Valedictory Report from Chris Bates MBE featuring the successful Joint Ministerial Conference and Chief Islander Ian Lavarello's 2014 UK visit. St Mary's School News from David Clarke. Tourist Feature including prices and tips for planning a visit. Front Cover : Photograph taken from Burntwood looking NNE across the Patches Plain with Hillpiece (and beyond the Goat Ridge) obscuring the view of the Tristan Settlement. 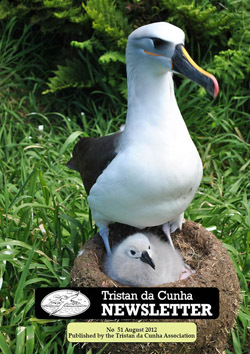 Alex Mitham takes the helm as Tristan's 22nd Administrator and surveys the Tristan scene - including celebrations to commemorate the 50th Anniversary of the return of Islanders from the UK in Glasgow and on Tristan. 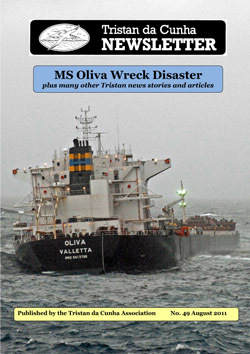 Extended article chronicling the wreck of the MS Oliva and its impact on Tristan's environment and economy. Tristan Treasure Hunt as the island seeks to retrieve a lost chronometer and medal presented by a former US President and a King of Italy to Islanders in the 19th Century for the Tristan Museum. 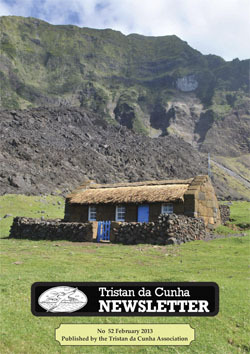 Publications news including a review of Jim Flint's new book Mid Atlantic Village and a Tristan Chart offer. 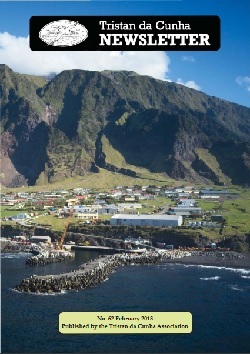 To obtain your copy join the Tristan da Cunha Association - see Association Shop and Order Form for details. 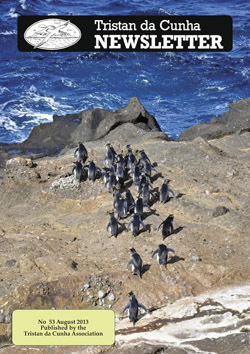 Cover picture – Northern Rockhopper Penguins on Nightingale Island in November 2010 from Sean Burns. and sets out the challenges for his time on Tristan. 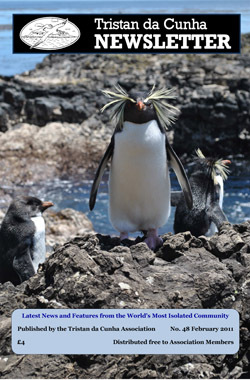 and the second edition of his book Rockhopper Copper. is a 36 page full colour magazine full of Tristan news and features. 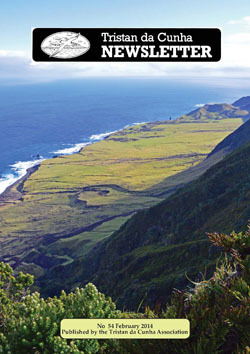 The February 2010 Newsletter was posted in late January. - see Association Shop and Order Form for details.